Meet Ted, the newest addition to our band of “Woodland Friends”. We had been told that there were Red Squirrels Sciurus vulgaris locally. So in our infinite wisdom we put up a squirrel feeding box, filled it with hazelnuts and hoped for a visitor. A year on and we had no activity on the feeding box. We moved the box a couple of times trying different parts of the wood. Then to our delight a Red Squirrel appeared sitting on the top of the box, mind you not eating any of the hazelnuts. A few days went by, still nuts in the box. Then one sunny morning, causally looking out of the window and voilà, there was Ted a Red Squirrel, happily eating hazelnuts. We spent the next 90 minutes watching him with great dexterity, breaking into and eating the hazelnuts. More supplies required. Another one to add to the feeding list; morning time, it’s refill the ground feeders, refill water bath, check peanut feeders and now check hazelnuts. 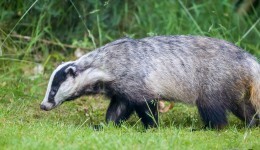 Evening time, put out Badger food and scatter peanuts, peanut butter and peanuts for Pine Marten. Ours doesn’t like jam sandwiches, despite what people say. 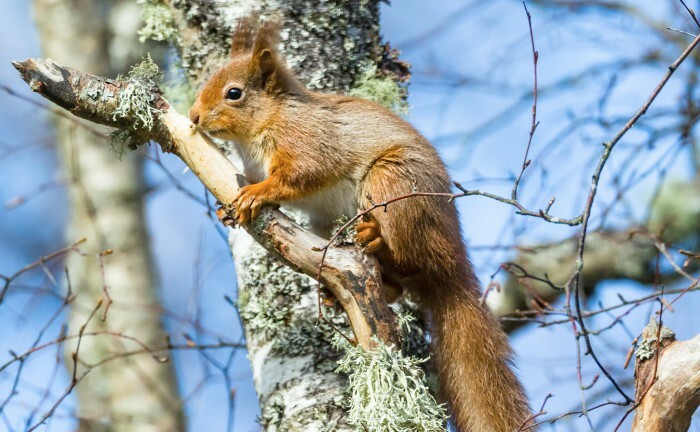 Tree cover in Scotland used to be so extensive that a Red Squirrel could have travelled from one side of the country to the other without touching the ground. Only 120,000 Red Squirrels are left in Scotland. That’s half the number of Grey Squirrels. Contrary to popular myth, Red Squirrels don’t hibernate. Squirrels can be either right or left handed. We can tell this by looking at the teeth marks left behind in pine cones once they’ve been eaten. Red Squirrels have trouble digesting acorns, unlike Grey Squirrels who love them! Cinderella’s glass (verre in French) slippers were actually made of Red Squirrel pelts (vaire) in the original fairytale. A Red Squirrel’s tail is particularly important. 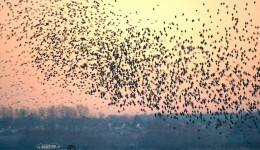 They are used for balance, communication, as an aerofoil when jumping and as a cosy blanket! Reds use their tufty ears to help express how they’re feeling – a bit like a dog. Squirrels keep more than one nest (or drey) at a time in case one gets stolen or blown away. This also makes it more difficult for predators to locate them. Young squirrels have to learn how to open hazelnuts. Squirrels can jump more than 2m. Squirrels can survive a fall of more than 12m without injury. Squirrels have double-jointed ankles to help them go down a tree head-first. Red Squirrels can have fur ranging from sandy orange to almost black. Squirrels can find buried food even underneath a layer of snow. A squirrel can tell a nut is rotten even without opening it.